Notice that even though you are involved in property investment, which is essentially bricks and mortar, the things you have to manage are people! Property is a people business so if you don’t like dealing with people then this may be the wrong industry for you. So let’s look at these twelve parties more closely – starting with YOU! Space Its no point thinking you can run a property portfolio from a lever arch file on top of the TV! You need to designate a place in your house to put a computer, telephone and your files. It could be a section in your living room or it could be a whole room. When I started the property business I lived in one room – that’s all I could afford! But I had one corner of the room designated as the office with my computer, fax/telephone, printer, stationery and files. Now I have a 300 sq ft office at home where I can get away from all distractions so I can focus on my portfolio and all the admin it brings. Having this space can certainly keep your stress levels down. Time Property can be a relatively passive way of making money but its not completely passive – no matter what Rich Dad said! You need to make time to look at all the admin that ownership brings, all the mortgage deals out there, current property prices and the market in general even if you only own one property. 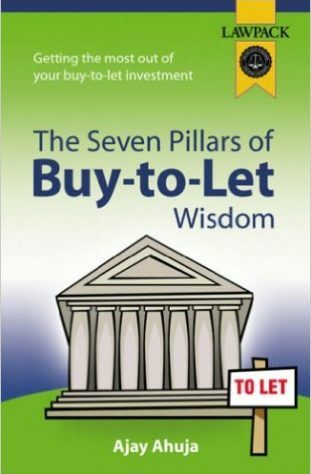 You have to keep abreast of all matters relating to property if you want to succeed at this game (see chapter 4 – Awareness) and this requires your time. I generally do my admin first thing in the morning so my mind is free to consider more taxing considerations such as other investments. If you hold down a full-time job then maybe its time to sacrifice your Saturday mornings for this task. If you do succeed at property investment and leave work then don’t worry, you’ll get all your Saturday mornings back as every day is a Saturday! State of mind You can be sure of one thing – there will be set backs. Tenants wont pay, repairs will need doing and interest rates will rise! The way you deal with these setbacks will determine whether you sink or swim. If you deem every setback as a catastrophe then you’ll find that you wont last long in this business. If however, you tackle each problem with a positive and clear head then a logical solution will follow. One thing with me is that I’m persistent. I refuse to allow any investment that I’ve acquired not make money – if I did then I would question my own judgement and I wouldn’t make anymore investments! You have to rely 100%on yourself. Expectations Your expectations of others should be reasonable. No-one will ever care for your investment as much as you would as its success does not directly affect their income. So if you instruct an agent to look after your property then do not trust them to have an urgency that you would have. Do not expect your tenant to treat your property as if it was their own as the property is not! If you have a sceptical view of all the people surrounding your property investment it will ensure that you keep on top of things. These people have to earn your trust – do not assume it! As mentioned above always rely 100%on yourself - never rely 100% on others. Keep a float Ensure that there is at least 3 months worth of monthly mortgage payments in the account. If it comes out of your current account then ensure there is 3 months worth plus whatever else comes out of your bank on a monthly basis. I personally keep 6 months worth of mortgage payments in my current account as I am extra paranoid. I nearly went bankrupt a couple of years ago due to me forgetting that the bank wanting their money on time! As a result I hold a large balance as I do not want to go through that stress again. Do what ever it takes. Don’t get hung up with where the money comes from to pay the mortgage. If you have to transfer money from your credit card to your current account to meet the payment then do it! You can always iron out the problems that led to you paying the mortgage with your credit card later but all that matters is that you pay the bank on time and in full. Bank cash Bank cash payments regularly. Don’t be carrying bundles of cash in your pockets or purse. Mortgage payments are made through the bank not from your left pocket! This will keep your bank balance healthy and your pockets lighter. Check balances often Keep abreast of your bank balance as often as possible. I have internet banking so I know my bank balance every day. If you don’t then you can check your balance from any cash machine if you have a cash card. It is good practice to check your balance daily to see what is coming in as well as going out. This way you will ensure that you can react to shortfalls promptly if they arise. If you’ve decided to instruct a letting agent then the management of tenant relations should be handled by them. Your job is to subsequently manage your letting agent – see below. If you’ve bravely opted to manage your tenants yourself then read on. They are not your friend Your tenant is not your friend! If your friend approaches you wishing to live in one of your properties then say no – make some excuse. We all know the feeling when we’ve lent a friend £20 on a night out and then we have to ask for the money back – we all hate doing it. There is a good reason why we don’t like doing so and that is because money and friends don’t mix. Many friends in the past have fallen out over very small amounts of money, let alone a month’s rent. Look after them Having an absent landlord can be very frustrating for them and can sometimes result in damage to your property through neglect by you and ultimately the tenant. If your tenant calls you then answer the phone. If they leave a message then get back to them. And if they don’t call then call them once in a while to make sure everything is alright. Now I’m not saying to respond to their every whim. If they call you asking for a new toilet because its dirty (which has happened to me!) then you politely tell them that even though it is a dirty toilet it still works. Suggest a strong cleaning agent that could rectify the problem but do not give in to anything more than your contract commits you to. If however, they have been good paying tenants and have hardly called you with any problems for a period of over 2 years or so then consider it – is the cost of a new toilet worth it thus maintaining the relationship with the tenant and lowering the risk of losing them? You have to use your judgement. Have an agreement The standard contract that binds a landlord to a tenant is the Assured Shorthold Tenancy agreement (AST). Its important to have one to start off with and to renew it when it expires. This will set out what is expected from both parties thus avoiding potential disputes. If there is something particular you want to include in the contract, such as responsibilities for garden maintenance, then do so. Its an idea to talk through the terms with the tenant so that you are both in agreement verbally as well as written. Ask around Speak to independent parties about the letting agents in the area. If you have an agent in mind then ask specifically about that agent. The estate agent who you are buying the property from may know of a good letting agent. Ask how long they’ve been in business and how many properties they manage. Look around See which agent’s advertising boards are around the most. Biggest is not usually the best but if you have an agent that is keen to get his or her name about it would be likely that they will want to do a good job. Visit their offices – are they in the town centre? Can the tenants get there easily enough to pay their rent? Are there enough staff to handle the calls? When you ring does someone answer? Are their staff smart looking and keen to provide a polished service? Check their terms and conditions Are they easy to read and fair? You don’t want to instruct an agent to find out that you have to pay a fortune to de-instruct them. I was asked to pay £1,000 to get out of a contract because they had found the tenant. I never paid it and they threatened to take me to court. Eventually they went away without payment. If you find that you’ve chosen the wrong agent you want to be able to get out from their management easily. The only way you are ever going to find this out is through time and time only. Choose If the shortlist is only one then the choice is easy! Otherwise you just have to take the plunge on the agent that you feel you best get on with, that speaks the most knowledgeably and appear to work the hardest. Do not get bamboozled by fancy letterheads, state of the art offices or smooth speaking representatives. All that you are interested in is that you get your rent in full and on time. If the agent is a member of ARLA, the Association of Residential Lettings Agents, then this should give you some comfort. The real (and only!) benefit of choosing an ARLA member is that you are covered against fraud by the agent without having to prove who is at fault. Do not let your selection process be simply choosing an ARLA letting agent. A letting agency is a people’s business and it doesn’t matter what professional standards bodies they are members of, if they have the wrong people the job will never be done properly. Statement arrives late Ring the agent A letting agency is run usually by young people. We all know the majority of young people have other things on their minds! If the support staff are late getting the paperwork to you then let them know that its late. This way they may prepare your statement before other landlords. Speak to the tenant Again let them know that you know that its late. Agents holding on to cash really annoys me. Its your money, not theirs. You want the interest that it can earn or more importantly the money it can make from further property investments. You need to know the full answers on this. Simply saying they have wrote to the tenant is not good enough. Have they visited? Ask them what THEY are going to do about it. Excessive fees from agent Ring and/or write to the agent If they’ve added excessive fees to your account and its not clear where they’ve come from then get a full justification for the charge. They have to deem the charge reasonable for what they’ve charged for and outside of their normal management duties. Estimate the amount of hours they have spent and assume a rate of £15 - £25 per hour rate. Management Style Definition Suitable For Property Investment? Exploitive authoritative Management uses fear and threats; communication is top down with most decisions taken at the top; superiors and subordinates are distant. No! We are not operating a sweat factory. Let me remind you again this is a people’s business. This includes the people within your business. So dictating your ideas is not the way forward. Benevolent authoritative Management uses rewards; , information flowing upward is restricted to what management wants to hear and whilst policy decisions come from the top some prescribed decisions may be delegated to lower levels, superiors expect subservience lower down. No again! You need to know what is going on at base levels. The best people to know this, and hence set new policies, are the people dealing with the tenants, agents, authorities etc. So you must listen to your employees that are dealing with these people so you can construct the right policies. Consultative Management offers rewards, occasional punishments; big decisions come from the top whilst there is some wider decision making involvement in details and communication is downward whilst critical upward communication is cautious. Maybe. This all depends on your employees. If they are self starters then this may not be applicable. If they need little supervision, believe in the common goal and are hard working then you can adopt the style below. Otherwise consider this style to make sure that what you ask to be done – gets done. Participative group management Management encourage group participation and involvement in setting high performance goals with some economic rewards; communication flows in all directions and is open and frank with decision making through group processes with each group linked to others by persons who are members of more than one group called linking pins; and subordinates and superiors are close. The result is high productivity and better industrial relations. Yes! To manage a property portfolio you need buy-in from ALL your staff where possible. If an employee has an idea then find out the depth of it. If you have an idea then get buy-in from all your employees. Once you have people on-side then you have the magical collective known as a TEAM! Once you’re a team then its very difficult to stop you. Source: Likert, R. (1967), The Human Organization: Its Management and Value, McGrawHill. What ever you do – do not consult your local Yellow Pages for a builder. There are many rogue contractors that spend a small fortune on advertising in the Yellow Pages posing as many different firms. You will ring around from the different ads but ultimately you will speak to the same few contractors that employ this scam. My advice is to use a builder from the National Federation of Builders (NFB). The National Federation of Builders is the industry’s longest established trade association with almost 3,000 member companies, ranging from smaller builders to large contractors. It has a network of regional offices across England and Wales - each one can provide a list of reputable, professional companies in your local area. Member companies of the NFB have satisfied the most stringent entrance criteria for any building trade association. Companies must provide at least eight references from accountants, previous clients, suppliers and professionals such as architects and surveyors. All references are followed and, if satisfactory, applications are then put before a panel of existing members who are local to the potential new member for assessment. Every potential new member is also visited on site before they are accepted. If the panel is satisfied with the company's technical competence, health and safety standards and financial probity, the company is admitted into membership. All member companies must be VAT registered (if applicable) and CITB-registered. The Federation also operates a Code of Conduct and a full complaints procedure, which involves a mediation and arbitration service. Complaints are thoroughly investigated by the NFB and if a member is found to be in breach of the Code of Conduct they are expelled from the organisation. All NFB members can offer customers the ‘Benchmark Plan’ - an insurance-backed guarantee scheme which pays out the cost of correcting any building work defects for periods up to 20 years. You can find your nearest NFB member by visiting www.builders.org.uk. The NFB also encourages its members to use the JCT building contract for homeowners and occupiers - a straight-forward, plain-English contract - which sets down in writing what’s expected of you and your builder, such as payment terms and agreements, helping to avoid any potential disputes. For a copy, priced £9.95, call Construction Industry Publications (CIP) on 0121 722 8200 or order it online at www.buildingcontract.co.uk). Ask friends/relatives/neighbours who they use. Use a member of the Institute of Plumbing - members have to hold recognised qualifications in plumbing and/or extensive experience. Get at least three quotes - when asking for quotes find out if there is a call out fee and many people will be doing the job and if the price per hour includes all the workmen/women or if more is charged per plumber. Ask for a written quote - unless there are any unforeseen costs, the final bill should not deviate too far from this initial written quote. clearly explain all of the work you need doing - write it all down if possible. Ask how long the job will take. When you have found a plumber and the job is completed, ask for a full breakdown of the bill so you know where your money has gone. Never pay upfront before a job is completed. Good plumbers will be busy no matter when you call. Don't give up on quality to get a job done quicker. Don’t be scared to ask questions, a Registered Plumber will be knowledgeable and able to answer anything you need to know. As with the builders and plumbers you need to go to an electrician that’s a member of a professional standards body. The National Inspection Council for Electrical Installation Contracting (NICEIC) was set up more than 45 years ago and is the electric industry's independent, non profit-making, voluntary regulatory body covering the whole of the United Kingdom. They are not a trade association and do not represent the interests of electrical contractors. In order to protect users of electricity, the NICEIC endeavours to register as many electrical contractors as possible that are able to comply with its Rules. Every contractor that applies for registration is subjected to detailed assessment by the NICEIC, including the technical standard of their electrical work, before being admitted to the Roll of Approved Contractors. They employ more than 50 Area Engineers who make annual visits to Approved Contractors to assess their technical capability, and inspect samples of their electrical work. You can find a suitable electrician in your area by visiting www.niceic.org.uk. Fix the fee Do not let them charge you on an hourly basis for their fees. If you choose a solicitor that specialises in conveyancing then they will know how long a purchase takes and should be able to quote you a ceiling limit fee. Be careful of hidden charges such as telephone calls and letter charges. Make sure there are no hidden surprises. Be careful of useless insurance policies they add to the bill. Tell them you do not want any insurances covering you for unspotted defectives. If the solicitor doesn’t spot it then you can have a claim against them instead of the insurance company. A solicitor is more likely to pay out as no solicitor wants the wrath of The Law Society. Fee free for abortive purchases. If you can try and arrange a nil charge if the sale doesn’t go through. This may be difficult if you are buying only one or two properties but if you are buying a few and intend to buy in the future then it is good to set up this arrangement. The worst thing is having a solicitor’s bill on top of survey costs for a property you have lost due to the vendor pulling out. Pay for searches last Where possible apply for local searches last. This way if the purchase does fall through in the meantime you haven’t paid out on searches. Don’t hassle them Buying a property is a very slow process. There is no need to phone your solicitor every week. As long as you provide all the information they ask from you then there is no need to call. If you’ve heard nothing for 6 weeks then maybe its worth a quick call for an update. Make sure they communicate with all parties. Estate agents like to be kept up to date with the sale as their commission depends on it. If the agent doesn’t hear anything from the solicitor then the agent tells this to the vendor and sometimes the vendor places the property back on the market. Speak to the estate agents to ensure they are getting feedback from the solicitor and they are fully informed. Find out that both yours and the vendor’s solicitors are in communication with each other through the estate agent. Do not exchange contracts until mortgage offer received Under no circumstances should you exchange without knowing you have the funds to complete. This means a proper mortgage offer being received by your solicitor with all outstanding terms of the mortgage offer met. A good mortgage broker can be key to the whole buying process. Its not about getting the best deals. The difference between the best mortgage deal and the worst is nothing to write home about if you have bought at the right yield – see the chapter on yield above. Its all about getting your broker on your side. I hate filling out forms. I think we all do! I do about 100 remortgages and purchases and if I had to complete them all myself I probably couldn’t find the time to buy any properties! Brokers are only too willing to fill out these forms as they only have a chance to earn their commission if they submit a completed application form. Take direction from them rather than you direct them. They know what they’re doing. My broker finds the lenders and I go with her recommendation. The only say so in the matter is what rate I go for but I have to admit if she told me what rate to go for I would go for it- no questions asked. Now this may not be possible in all circumstances as the best brokers do charge a fee. Look for the broker to waive their fee after say 10 deals a year. Try and get the broker to keep the agent updated on your case. The last thing you want is pushy agents ringing you up all the time asking questions that only your broker can answer. If you’re struggling to find a suitable broker then try my one. I cannot promise she will grant you the same terms that I have (because I’m serious about property investment!) but its worth a phone call. Contact Liz at Connect IFA on 01708 443334 and mention my name and you’ll get a 50% discount on her fees. If you’ve decided to accept the low paid, unemployed, sick or invalid as your tenant (which I suggest you do) most or all of your rent will be paid by the local authority. Getting the first rental payment from them can be a mission but after that its an easy ride. Let me tell you a little bit about how it works. If you are a landlord wishing to rent out property, you may have tenants entitled to help from their local council towards paying their rent. Should a tenant make a claim for this help, called Housing Benefit, the local council will normally ask you for some simple information about the tenancy. Below is how Housing Benefit is calculated, what information the tenant will be asked for and what information you will need to provide in order that an assessment of the level of Housing Benefit payable can be made. Housing Benefit is a government scheme administered by local councils that gives help towards housing costs for people on a low income including those who receive Income Support or Job Seekers Allowance. A claim is made by completing a Housing Benefit Application form. A tenant does not need to tell you that they have claimed benefit. The Council can only discuss a benefit claim with a landlord if the tenant has given his or her permission in writing for this to be done. What tenancy information is needed? Almost all claims for Housing Benefit are referred to the Rent Officer for a decision on a reasonable market rent for the property. Rent Officers are employed by the government to help the Council work out how much Housing Benefit a tenant can have. If a rent is considered to be unreasonably high, then the amount of Housing Benefit paid could be restricted. Housing Benefit may also be restricted because a tenant is living in a property which is larger than needed. For example, a couple with one child needs only two bedrooms, so their Housing Benefit may be restricted to the level for a two-bedroom house and not the three-bedroom house they actually occupy. The following criteria are used when deciding whether a property is or is not overlarge. Housing Benefit cannot be paid for that part of the rent which covers services such as water rates, fuel costs or meals. The costs of these items are deducted from the rent payable before Housing Benefit is calculated. The remaining figure is called the Eligible Rent. A person who receives Income Support could be entitled to their full eligible rent. A person not on Income Support but on a low income will receive only part of the eligible rent. Housing Benefit is always paid on a four-week cycle. If a calender monthly rent is charged, the appropriate weekly rent will be calculated and then paid on the usual four-week cycle. So, if a tenant is entitled to full Housing Benefit they would expect to receive £460.27 every four weeks, which is 4 x £115.07 weekly rent. If you are looking for rented accommodation and need to know the maximum amount of housing benefit you may be paid you must obtain a Pre-Tenancy Determination. Housing Benefit is paid every four weeks, in most cases 4 weeks in arrears. Housing Benefit is paid to the tenant unless a rent direct form is completed, in which case the benefit will be paid to the landlord. If the Housing Benefit is paid to you as the landlord you will also receive a schedule showing which tenants' Housing Benefit are included in the cheque and how much benefit is in respect of each tenant. How long is housing benefit paid for? All benefit claims are reviewed at least once a year. Benefit will continue as long as there is entitlement and providing the claim review form is returned on time. Housing Benefit is only paid while a tenant lives in the property. Entitlement to benefit ends as soon as a tenant leaves the property. This condition also applies if a tenant dies, as entitlement ends on date of death. Entitlement may continue during a temporary absence from home. If a tenant moves out or dies and you have been paid Housing Benefit beyond your tenant's change of address or death, then you will have been overpaid. You will have to repay this money. There may be times when the Housing Benefit Section finds out a tenant has left before you do. Housing Benefit will still end on the date the tenant is known to have left - any further rent due is a matter for you to pursue with your tenant. Also if the council find out that he is working and is not entitled to housing benefit anymore the council will come after you if they have paid the rent directly to you. I have been the victim of this many a time. I have had to pay back anywhere between £70 to £2,400 back to the council due to my tenant being ineligible for housing benefit. The law has to change as there are many landlords losing out due these claw backs. You have to decide whether you trust the tenant to receive their benefit directly and pay it over to you or get it paid direct to you but take the risk of clawback. I always favour getting the rent paid direct and risking a clawback. What does the Council need from the landlord? Under normal circumstances the tenant is responsible for paying their council tax. If however the property is empty then YOU are responsible for paying the council tax. The council tax departments are hot! They somehow know how to track you down to pay the tax so there is no point avoiding their charge. If you do you could face being up in front of a magistrate and ultimately having your goods seized by registered bailiffs. Please ensure you communicate to the council the status of the property to ensure you can claim all the exemptions allowable to you. This section applies only to leasehold properties i.e. flats and maisonettes. This is a book in itself. There have been many changes to the law giving more rights to leaseholders due to the unscrupulous behaviour of certain freeholders and managing agents. If ever I have seen criminal behaviour within property investment the majority of times it has been within this sector. Leaseholder The leaseholder owns the right to occupy the premises for a certain period of time, typically 100 years. He is allowed quiet enjoyment of his lease like you would expect with the ownership of any asset. He is expected to contribute to the maintenance of the building, insurance and cleaning of common areas. He is also expected to pay a ground rent to the freeholder. Freeholder The freeholder owns the building and has granted leases to the various leaseholders. The building belongs to him but he has no right of access to any areas covered on your lease. He only has access to the common areas. The freeholder is your landlord and expects the ground rent from you and any cost associated with the building. He can take your lease away from you (through a lengthy court procedure) if you consistently breach the terms of the lease. Managing Agent IF the freeholder wishes to outsource the management of the building they instruct a managing agent to handle the day to day organisation of cleaning, maintenance, building works and administration. The freeholder or managing agent will send you a bill for the ground rent and service charges either monthly, quarterly, half yearly or annually. There are some that will charge you what they think they can get away with. I have a flat where the service charge is more than the mortgage! Not pay The service charges have to be reasonable. If the managing agent has charged you £50 for changing the lightbulb in the common area then this would be excessive. Reasonableness is determined by the Fair Value Tribunal (FVT). If you think they are unreasonable then you can wait for the managing agent to take the matter to the FVT. You have to write to them to dispute their charge. Do not simply refuse to pay. I have one managing agent charging me 29.5%APR on late payment, £23.50 per letter or email sent which he sends every week and charging me £48 per hour for his time in dealing with my case. I haven’t paid him for any of these charges. I have simply paid the service charge without all of his fees added on. He hasn’t taken me to court as I know that the tribunal or court will laugh at his extortionate charges. Offer a settlement Just pay what you think is reasonable. It will be down to them to take you to the FVT or court for the difference. If the court deems that what they are charging is correct then you have to pay it as you do not want to lose your lease. Usually they wont take you to court and you can carry on paying what you think is fair. Ask for the financial statements The managing agent has to provide you with the latest financial statements within 28 days of your request otherwise it is a criminal offence. IF you dispute the service charge bill then look at the expenses they are incurring. Then you can pinpoint where the over charge is – its usually the management fees! You are well within your right to visit the premises to inspect each and every invoice that make up those accounts and to challenge them. Seek outside help. The obvious place to go is to your solicitor. But there are other organisations that can help such as www.lease-advice.org.uk, www.leaseholdadvice.co.uk or www.arma.org.uk. If you’ve instructed an accountant to handle your affairs because the thought of filling in your own tax return seems too daunting then you have to mange him or her. You go to an accountant that has been recommended to you This is the best way to get anyone to do work for you. If you can afford one go for a chartered or certified accountant. If You can’t find one from recommendation then visit www.icaew.co.uk or www.acca.co.uk to find the nearest accountant in your area. You get all the info to the accountant on time For your accountant to give your case the time it deserves then ensure you provide him or her with all of the information on time. I know this sounds obvious but you would be surprised how many people leave their tax affairs to till the last minute – including me! I think it has something to do with the fact that we all hate paying tax so leaving it to last means that we some how stall paying over the tax – this is completely untrue! If you can get your form in by 30th September as the Inland Revenue will calculate your tax for you. They are knowledgeable in land and property tax In order to pay the least tax they should know how to obtain all the reliefs due to you to shelter your profits from tax. Ask them if they have any clients that are involved in property investment. See if he or she is aware of allowances such as ‘wear and tear’ allowances for furnished properties. The fee is agreed in advance Do not let the accountant charge you by the hour. Once you have shown him or her your type of records, the size of operations and number of transactions it should be easy for them to calculate the fee. Be clear what you want from your accountant. If its just your tax return completion or the whole package including bookkeeping, payroll etc. A yearly inspection is needed for all electrical appliances supplied with the property by an NICEIC contractor. Basically anything electrical will need to be examined and passed by the NICEIC contractor. You breached that duty of care. Zak breached that duty of care, as he did not fix the socket when asked to by the tenant. Even if your tenant hasn’t paid you any rent for two months you cannot ‘send the boys round’. Threatening your tenant or being violent to your tenant because he hasn’t paid you any rent is no justification for your behaviour in the eyes of the law. Investing in property can sometimes challenge your ability to remain calm and situations can become quite heated. Remember, it’s only money! This is the phrase I say to myself when I get stressed when a tenant ‘does a runner’ and leaves me with £1,500 owing. Like I said in my introduction, you have to be a responsible person and realise that if you want to take investing in property seriously then you have to act lawfully in every way.